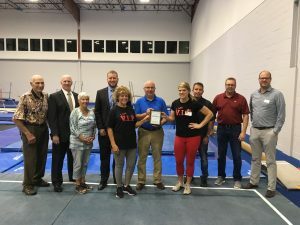 The North Sioux City Economic Development Corporation presented its September Business of the Month recognition to V.I.P. Gymnastics, Ninja, and Cheer. V.I.P. Gymnastics, Ninja, and Cheer was created out of a dream from a mother, daughter duo who fell in love with the sport. Val Dykstra put her 3 daughters in gymnastics and coached to pay for their tuition. Her daughter, Alisha Dykstra quickly followed in her mother’s footsteps teaching classes, developing curriculum, and training gymnasts from preschool to elite. Both have coached regional and national qualifiers and gymnasts who received full-ride scholarships. The concept of providing gymnastics to kids while they are at daycare preschool was presented and Val started the Superstar Tumblebus. They began with 3 daycares and 60 kids in the program. The program has been a local favorite for over 19 years. They expanded to Sioux Falls and had 4 buses providing gymnastics classes to over 600 kids in the two locations. Currently, they provide learning and fun to over 300 students in the Sioux City area. Parents have been begging them for years to provide classes in our own facility and they are ready to answer that plea. To learn more, visit V.IP.’s website at https://www.vipgymnasticsninjacheer.com/ or contact them at 605-540-0854 or alisha@vipgymnasticsninjacheer.com. V.I.P is located in the former Gateway Argentina building at 300 Centennial Drive, Suite 150. North Sioux City, SD 57049.